There is movement away from the beige-on-beige theme to more sophisticated taupes, greys, pewters, creams, almonds and cappuccinos. These rich tones add variety and interest to spaces while maintaining the virtue of not being statements in and of themselves. OTTAWA — There are many factors to consider when choosing a new condo. Competing for attention are details concerning location, site orientation, views, size, potential for resale and, often most importantly, cost. There is, however, another set of factors that buyers may not fully consider. These are the interior design features that come with the condo. Specifically, I want to discuss condo palettes — the hues of walls, fixtures, cabinetry and window treatments. Let’s assume you are not one of those lucky individuals who is starting with a bare-bones unit for which you will choose all spatial arrangements, appliances and finishes. In reality, most new buyers cannot boast of extensive experience in condo design and an absence of budget restrictions. Rather, they rely on pre-designed packages that include specific colour palettes and decor choices. One way developers attract buyers is through interior design; they offer a variety of samples of flooring, cabinetry and countertops. 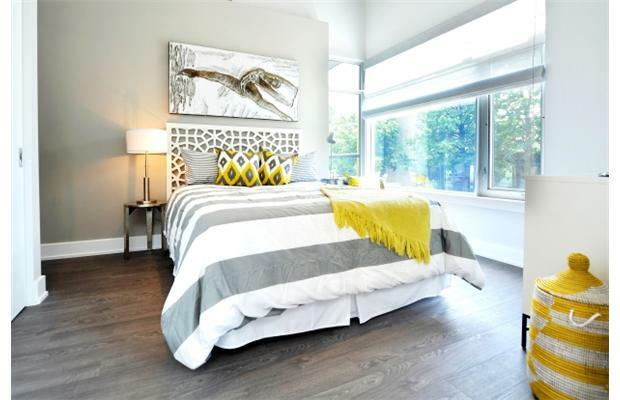 Builders are always thinking forward in the rapid-paced environment of condo development, so predicting potential colour and texture trends when a condo is ready to be sold can help differentiate a builder’s offerings from those of the competition. Not only that, but as condo showrooms come out months — sometimes years — before construction, colour trends are often chosen in advance. For instance, 2014’s must-have features and colours have already been established. Builders usually enlist the expertise of the best interior designers in the country to develop their interior design palettes. Since many of these designers’ fees are beyond what most individuals are willing to pay, a buyer can benefit indirectly from a designer’s skills by purchasing a condo whose palette is a result of careful consideration. In general, builders try to supply prospective purchasers with the hottest and most desirable designs, thereby outdoing their competition. Model suites will give you your first taste of a condo’s palette offerings. On show are a spectrum of colours, textures and design features that can be selected at no extra cost. The more you relate to the basic palettes offered, the more you get your money’s worth. If you have trouble picturing yourself living among this decor, it may be time to consider another development with a different designer. This will prevent you from struggling to accommodate someone else’s taste. To complicate matters, the builder will offer a wide selection of extra-cost upgrades — flooring, appliances, built-ins, countertops and backsplashes — the list goes on and on. If you don’t see an upgrade you want, just ask, as most requests can be accommodated. If you have a clear sense of what works for you, the selection process can be relatively straight forward. Remember that a reputed designer has been working in the background on your behalf, and now the builder will supply an experienced consultant to help with the decision-making. Despite this, you may also want to enlist the services of your own designer to help organize the palette and options to create your own unique space. If you go this route, make sure to pick a designer with similar tastes to your own. This is best done by viewing examples of their work, something most designers will be happy to arrange. You may be wondering what the current trends are. Textures are evolving rapidly with many designers forgoing classic granite and tile themes in favour of composites and polished concrete set off by smooth or sandblasted glass or stainless-steel backsplashes. For bathrooms, highly textured river rock or pebbles in black, browns, cream and sand stimulate both the visual and tactile senses. Textured area rugs are used to give interest to hardwood or polished concrete floors. I often see many condos that are well designed with beautiful furnishings, but sometimes an incomparable view diminishes the importance of small decor details. Ottawa has condos offering spectacular, sweeping views of the ByWard Market, the Gatineau Hills, the Ottawa River, the Rideau Canal, Parliament Hill, the Canadian Museum of Civilization and, of course, ubiquitous National Capital Commission parkland. Make sure you consider your views when you consider your colour palette. In Ottawa, it’s important not to forget that seasonal views may have a strong influence on your colour palette. For instance, you may want to opt out of an all-white palette, as the decor will suffer when the city is blanketed in snow. Whatever you choose, try not to go too bold with your palette, as you may get sick of it or suffer during resale. Otherwise, follow the instincts of your taste, and happy condo hunting. Marilyn Wilson has been selling real estate for more than 24 years and owns Marilyn Wilson Dream Properties Inc. Brokerage in Ottawa, an Exclusive Affiliate of Christie’s International Real Estate. She can be reached through dreamproperties.com or follow her on Twitter@marilyn_wilson.